Shhhh...the aliens are already here. Have you looked at the people in a Dollar General? They're not from this solar system. And one serious geek point - reflector design is just as important as wattage. Just a safety tip. If you see a can of crab soup at the Dollar General, do not purchase it, even out of curiosity. Another fun example of bad lighting: a photographer proved that bright lights don't increase "security" by showing two photos side by side. In one, there's a "security light" shining directly in your eyes. All you see is the glare bomb of light. In the second, the photographer holds his hand out to block the blinding light (essentially creating a shielded light fixture), and it reveals a man standing just beyond the light, who was present in the previous shot...you just couldn't see him! I love this example b/c it has been my experience more than once that lighting made it hard to see the ground in front of me or pedestrians in the street (hello TU acorns!). Patric, I wanted to run this by you to see if it's near right. Unfortunately I haven't bought the book on street lighting yet, but I wanted to run this by you. As I understand, as you increase fixture height, you increase wattage with a given light source to maintain light levels, be it foot candles or lux, at the street level. Think of holding a flashlight about a foot from a piece of paper and then imagine moving that light farther and farther away. You'll notice that the light spreads over a greater area, but the intensity of the light drops as the light covers the greater area. Yes. That's exactly how it works for a given type of bulb. ...but I cant emphasize this enough: "Brightness" (Luminous intensity) is expressed in Lumens (not Watts) and different light sources produce different ratios of Lumens per Watt. I have seen some well-intentioned but failed lighting installations where someone proscribed a limit on pole height without reducing intensity, and the result was massive pools of light close to the ground. Pole height shouldn't be an arbitrary number, but rather one based on the "cutoff" angle built into shielded fixtures and the distance from the property line. The "Kennebunkport Formula" is a design tool applied to area lighting to insure such lighting does not encroach upon other properties or rights-of-way. It applies to commercial and residential lighting (as opposed to street lighting). The formula helps calculate the mounting height and distance from the property line a Full Cutoff fixture needs to be to not trespass. Builders like it because they can specify lower wattages and save money not having light wasted where it's not wanted. Unfortunately, the city I live in doesn't seem to understand the inverse square law. I think my city has a big problem. They make use almost exclusive of use of 70 watt HPS cobra heads in the wasteful semi-cutoff configuration everywhere, neighborhoods, arterials, and so on. They use shorter fixture heights in neighborhoods and some residential streets such as mounting heights of 22 feet, but they use the same fixture with comparable spacing on a larger arterial with mounting height as much as 35 feet. I noticed that our arterial streets with heavy traffic are almost pitch black, so with adjusting fixture height to cover a greater area with the same luminaries all my city has achieved is darkening itself. 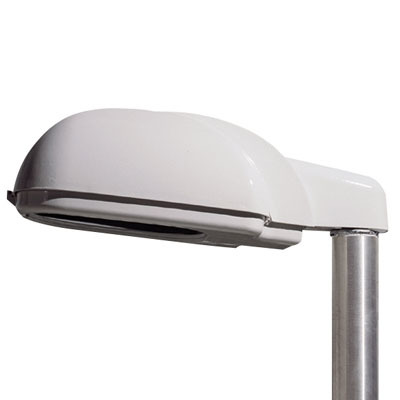 While all the light is still there, the luminous intensity underneath each fixture is not as high as each neighborhood light mounted on the shorter poles. I know pole spacing is another element, but it's just so dark underneath each light. I was thinking of a solution to this. If the city was unwilling to go with any fixtures of a greater luminous output, would it be wise to restrict fixture mounting heights? Sorry about that last bit if it didn` t contribute to the discussion. I got the book on street lighting from the IES. It is mind blowing.I`m still trying to pick up information from it. One thing that still gets me, how is it that the IES could recommend semi cutoff lighting when the notorious drop globe lens cobra head is so wasteful,unless I`m missing something? The Illuminating Engineering Society (IES) actually does recommend Full-cutoff fixtures for all new roadway lighting. You can see examples of the later along Riverside Drive south of 21st street. There are still some older model FCO lights closer to 21st and along the river bridge that are working. So the only question now is, will they do a good job of lighting (like what was done with Cherry Street) or will they get the prison yard treatment (like what was done with the LightsOn 2011 appeasement) ? Admittedly, the area is in need of some basic infrastructure. and some good quality, shielded (low glare) light at intersections isnt unreasonable. I wish I knew more about Mohawk. What kind of nightime pedestrian traffic does it see? I like the clean lines of this one personally, and it's full cut off as opposed to semi cut off. I think it goes to show that the cobra head doesn't have to be so bland. Admittedly the concrete poles aren`t that frangible in a crash, but most acorns aren`t either. The first two you link to are essentially what you see on most Tulsa streets, which are semi-cutoff Cobra-heads, while the third are Full-cutoff Cobras. The later flat-lens are easier to manufacture than the drop-lens, so FCO cobras tend to be cheaper to buy. If the public works people are on the ball, they can also be cheaper to operate since you can reduce the lamp wattage a step or two because FCO are more efficient and more of it's light is focused where it should be. Acorn-style lamps tend to be deadlier in accidents because the globe is extremely heavy and tend to go thru windshields. Think "liability"
Are you certian the flat lens lights are cheaper? The Texas Ida made ir seem that full cutoff lights could cost several dollars more a light with competitive biding. I to share some more lights. This street light, in particular, astounded me. It's a massive 400 watt HPS full cut off cobrahead with a fixture mounting height of around 35-39 feet. I had to get in idea of how thick the poles were, so I held out my arm. The pole diameter was from my fist to my elbow, or it was a 15 inch thick pole. I`m curious, could we use the inverse square law and lumious efficacy to find out the horizontal light output of such a beast? Are you certian the flat lens lights are cheaper? 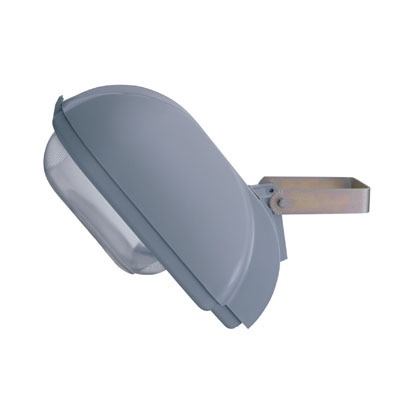 A clear flat glass lens is a lot cheaper to manufacture than the molded "drop lens" refractor, The aluminum reflector behind the lamp is stamped differently, but it's the same amount of material. GE (at least) reflects that savings in their unit price, I believe others as well. If you are talking the whole installation, closer pole spacing is often (but not always) used with FCO (shielded) fixtures in new installations. For years utility companies used pole spacing to argue against converting to the better shielded lights, but they were only considering their profit margin and not the quality of the finished product. You should be able to get output numbers from the manufacturer's cut sheets, and how much light falls where by looking at the IES photometrics that each manufacturer publishes. Alright, so it looks like Las Vegas is basically following IES standards. Assuming the luminious efficacy is around 90 lumins/ a watt we should have a total light output of around 36,500 lumins.Using the inverse square law I got a luminious intensity of around 28 lux. It seems to fall in line with the IES standards for intersection lighting. I found a picture if a warm white, in this case 2800 kelvin, streetlight. It's a metal halide, and it's optics are poor. It's still worth a look, I think. Sorry about that, I forgot to include the fixture height of 36 feet and wattage of 400.